I asked a fellow bookie what she thought about “Snow Child” by Eowyn Ivey, and she replied with something along the lines of: “I loved that book! But I kind of didn’t like it. I read it in one day. But it was kind of slow.” Naturally, I found such an answer a bit odd. Yet when I finished reading the book (two days for me), I understood what my friend had meant. 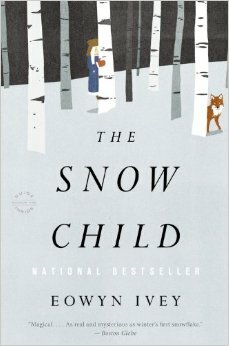 “Snow Child” is a novel built on simple writing, Alaskan winters, silence, and an old couple who may or may not have built a child out of snow. Although the writing style and subject matter is nothing at all like McCarthy’s “The Road,” it does share one commonality, which is the brilliant use of repetition. For McCarthy, the repetition was: gray, gray, gray. For Ivey it’s: snow, snow, snow. There was a helluvah lot of snow in the book, but I never got tired of hearing about it. That’s what I think my friend meant by being slow (repetitive) yet a fast read (simple prose). As for the loving it but not liking it, for me, the heart of the matter (barreness, children, birth) was not a subject I generally choose to read about, but the aura of mystery that drove the plot was riveting. The amazing thing about this book is that you can’t guess where it’s taking you until you get there. I don’t mean sudden plot twists, but instead, subtle directional changes that lead you to places where you never thought you’d go. Anyway, this book is definitely worth a try. And one more thing, even in the ugly, wet-heat of August, while reading this book I still felt cold, cold, cold. This entry was posted in Book Reviews, Fiction and tagged Alaska, book review, books, Eowyn Ivey, fiction, Pregnancy, Snow Child. Bookmark the permalink.